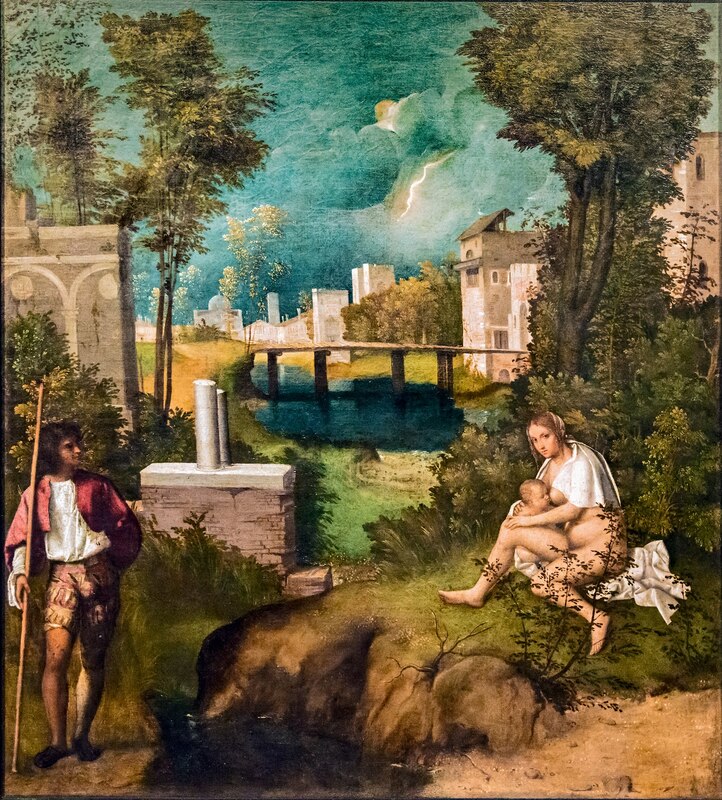 During this year I have been reprising posts that argue that some of Giorgione's mysterious paintings like the Tempest, the Laura, the Boy with an Arrow, and the Three Philosophers are actually "sacred subjects." Moreover, even when the painting has an obvious "sacred subject" I have argued that Giorgione's development of the subject was unique and exceptional. Here is a reprise of earlier posts on one of his most famous sacred subjects. 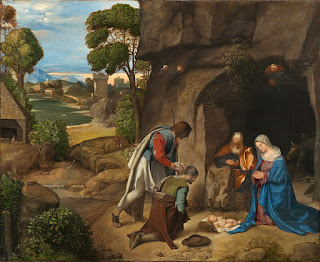 Scholars have expended more time dealing with the controversy that has surrounded the attribution to Giorgione of the so-called “Allendale Adoration of the Shepherds” than they have in trying to understand what is actually going on in the painting. Here I would like to deal with the subject and meaning of this famous Nativity scene that is now in Washington’s National Gallery. The subject of the painting seems so obvious. It is a depiction of the adoration of the shepherds who have left their flocks to seek out the newborn Savior after hearing the angels’ announcement. Here is the biblical text from Luke's gospel. Actually the newborn infant is lying on a white cloth that just happens to be on the ends of Mary’s elaborate blue robe that the artist has taken great pains to spread over the rocky ground. Giorgione is here using a theme employed earlier by Giovanni Bellini and later by Titian in their famous Frari altarpieces. The naked Christ is the Eucharist that lies on the stone altar at every Mass. The altar is covered with a white cloth that in Rona Goffen’s words “recalls the winding cloth, ritualized as the corporale, the cloth spread on the altar to receive the Host of the Mass.” In Franciscan spirituality Mary is regarded as the altar. His Eucharistic interpretation explained the naked infant on the hard, rocky ground. The infant Christ is the same as the sacrificial Christ on the Cross and on the altar at every Mass. In a study of Mary in Botticelli’s art Alessandra Galizzi Kroegel referred to this connection. It would appear that Giorgione has used the same motif although his angels have become little putti who hover around the scene. The shepherds represent participants in the Mass who kneel in adoration. Giorgione has moved the main characters off to the right away from their traditional place in the center. Rather than diminishing their importance this narrative device serves to make all the action flow from left to right and culminate in the Holy Family. Giovanni Bellini had done the same thing in his “St. Francis in the Desert,” and later Titian would use this device in his Pesaro altarpiece in the Frari. Finally, art historian Mario Lucco has suggested that the long hair of the one indicates a Venetian patrician in shepherd’s clothing. * That may be so but I like to think Giorgione indicated that the Savior, whether present on the ground before the shepherds as a newborn King, or on the altar at Mass, is accessible to all. This King is not protected by armed guards. There is no need to bribe or otherwise court influence with bureaucrats acting as intermediaries. Anyone, even the simplest and the humblest, can approach this King directly and in his or her own fashion. #Luke’s account of the angelic appearance to the shepherds is the traditional gospel at the midnight Mass on Christmas . The actual arrival of the shepherds at the stable in Bethlehem is the passage used for the gospel reading for the Christmas Mass at dawn. *Two recent catalogs have offered interpretations. 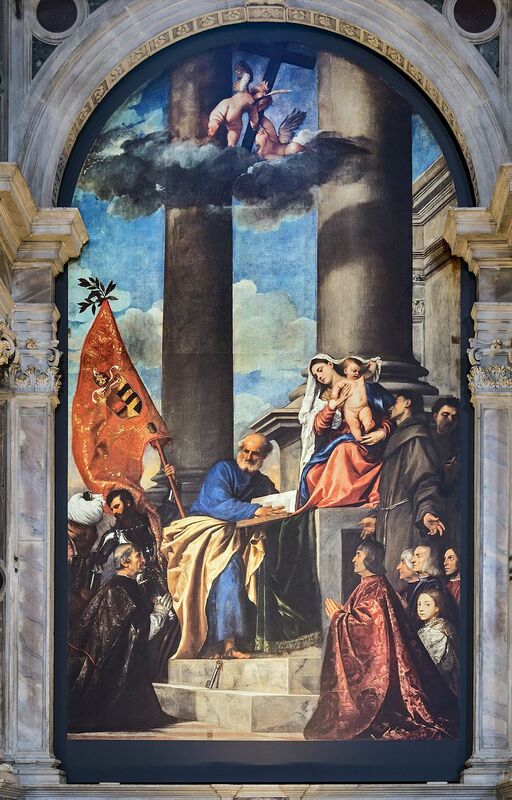 See Mario Lucco’s entry in Brown, David Alan, and Ferino-Pagden, Sylvia, Bellini, Giorgione, Titian, and the Renaissance of Venetian Painting, Washington, 2006. Also see the very strange interpretation of Wolfgang Eller in Giorgione Catalog Raisonne, Petersberg, 2007. **Rona Goffen, Piety and Patronage in Renaissance Venice, Yale, 1986. P. 53. ***Alessandra Galizzi Kroegel, “The Figure of Mary in Botticelli’s Art.” Botticelli: from Lorenzo the Magnificent to Savonarola, 2003. (ex. cat), p. 56. ## Our recent Bethlehem trip gave an unexpected context to the story.Your remarks on the adoration of the Christ Child as a representation of the first Eucharist and the hard ground/stone as altar are explained very clearly. What is perhaps unusual for a painting of this period is the depiction of a cave rather than a stable, as in Botticelli and others. This seems to hark back to much earlier art. Our first port of call on our Bethlehem trip was to the Shepherds’ field. There is a roomy cave there, now a chapel. Our guide told us that caves were the usual shelter for shepherds and their sheep – as I read it (via Wikipedia!) stables as such were a much later idea. So why did Giorgione go for a cave? A few random thoughts. The Grotto of the Nativity in Bethlehem was a cave. Venice was an important stopping place for Holy Land pilgrims at the time, which Florence wasn’t. The church of the nativity, the Shepherds’ fields and – I think significantly – the Holy Sepulchre were largely in the care of Franciscans, who had an important presence in Venice at this time. Could this be the basis of the tradition? So what about the Holy Sepulchre? The tomb of Christ was a cave too, and I wonder if this is implied in the painting. I wrote about this on my pages on the entombment – A cave behind, and often an altar-like sarcophagus in front with the dead Christ on it. Another Eucharistic image. A couple of interesting paintings. One you’ll probably know well as it is in the Met is the Adoration of the shepherds by Mantegna – I think the death and Resurrection of Christ are hinted at here too. I may be wrong, but I think the background shows a depiction of Calvary – that dying tree in front is emblematic too. Perhaps an even more interesting painting is another adoration of the Shepherds, this time by Cima da Conegliano, painted for the Chiesa dei Carmini in Venice, where it still is. The web Gallery of Art gives dates of 1509 – 10 for this – pretty well the same date as for the Giorgione. The similarities are striking, though Cima’s painting isn’t as good, and he includes some odd characters – what are Tobit and his fish and that archangel doing there? Both paintings have a couple of odd characters in the background, though one in the Cima is somewhat out of scale. Are they the shepherds at an earlier moment? What stands out for me in the Cima is the octagonal building in the background – I’m fairly certain this is the Holy Sepulchre, often depicted like this.